CNS): After more than one hundred hours of operations at the George Town dump extinguishing the biggest landfill fire on the island ever, the Cayman Islands Fire Service (CIFS) officially stood down and the last crew working at the landfill arrived back on Central Fire Station around 1:30pm Sunday, according to Acting Fire Chief Rosworth McLaughlin. Thanking God that that none of his officers were injured during such an extended and dangerous operation, he noted that such incidents normally result in firefighters suffering smoke inhalation at the very least. "Firefighters' personal protection is paramount and is an integral part of their fire ground training evolutions," he said. "I believe that the training these officers received paid dividend on this occasion and speaks volume of its effectiveness. This successful operation is also an indication of the high level of command and control procedures that were deployed by the highest ranking officer on the scene from time to time," McLaughlin stated. The acting fire chief thanked all the fire officers for their hard work and dedication throughout the emergency, in which, from Wednesday morning to Saturday lunchtime, firefighter battled a blaze deep inside the huge mound of garbage, known as 'Mount Trashmore', while smoke and fumes spread over the islands' capital. 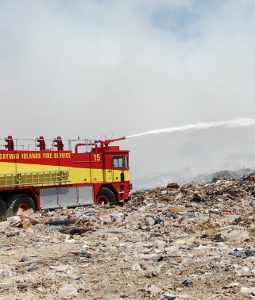 While the fire was believed to have been extinguished yesterday around noon, the fire service maintained a presence at the dump for an additional day to be on hand in case any part of the dump re-ignited. McLaughlin also expressed his gratitude to Department of Environmental Health Director Roydell Carter for his support during the lengthy operation, as well as Home Affairs Ministry Chief Officer Eric Bush, Premier Alden McLaughlin and Health Minister Osbourne Bodden for their visits and moral support during the emergency. He said the Burger King Restaurant assisted with some meals free of charge. "This is commendable and demonstrates the value of public and private sector partnership in a common cause. Special mention must be made of Mr Ernest Powell, who stayed on site and provided fuel for all equipment during the entire operation, McLaughlin said.